20 SMT Magazine • September 2016 while on the job through continuing education programs, such as those offered by Blackfox. In addition, employers can receive Department of Defense credits and, depending on the state, payroll tax incentives and subsidies. In an attempt to address this skilled labor shortage in the electronics industry, Blackfox has launched a program to prepare military vet- erans (and civilians) for employment. Blackfox Training Institute, as an approved technical training center for eligible veter- ans launched a new training program in 2013. The "Blackfox Veteran's Training Program" is the first program of its kind to provide veter- ans with little to no industry experience with the skills to grow their careers in the electron- ic assembly industry. Upon completion of the course, veterans can qualify for employment in aerospace, defense, medical, and all facets of electronic manufacturing. Blackfox prepares military veterans for em- ployment supported by approval under the provisions of "Title 38, United States Code" and recognition by the State of Colorado as an approved private occupational school qualifies Blackfox as a training center for eligible veter- ans wanting to use their GI Bill for education- al benefits. This program has been mostly funded through State and Federal training grants. There is no cost to the veteran. There is no cost to the employer whatsoever. As a matter of fact, we have not had any veterans in this program tap into their post-9/11 GI Bill benefits. It's all been funded through State and Federal grants so far. What is amazing is how many employers aren't aware of this program. This program was initially developed by Blackfox Training in cooperation with Lock- heed Martin and the first program of its type to prepare veterans who have military electronics experience, as well as those who have little or no industry experience, with the skills training and certifications that enable them to enter and create a career path in this growing aerospace/ defense industry. 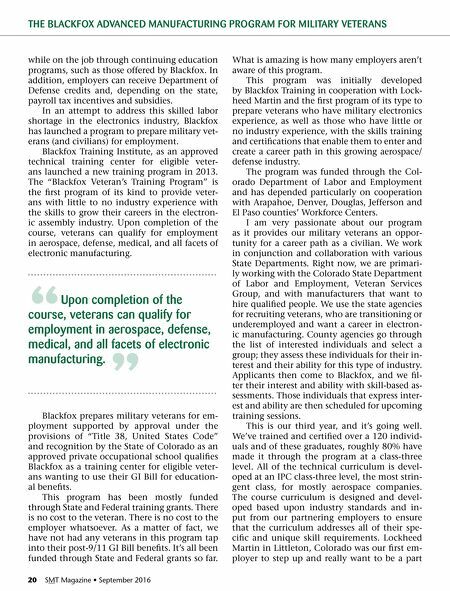 The program was funded through the Col- orado Department of Labor and Employment and has depended particularly on cooperation with Arapahoe, Denver, Douglas, Jefferson and El Paso counties' Workforce Centers. I am very passionate about our program as it provides our military veterans an oppor- tunity for a career path as a civilian. We work in conjunction and collaboration with various State Departments. Right now, we are primari- ly working with the Colorado State Department of Labor and Employment, Veteran Services Group, and with manufacturers that want to hire qualified people. We use the state agencies for recruiting veterans, who are transitioning or underemployed and want a career in electron- ic manufacturing. County agencies go through the list of interested individuals and select a group; they assess these individuals for their in- terest and their ability for this type of industry. Applicants then come to Blackfox, and we fil- ter their interest and ability with skill-based as- sessments. Those individuals that express inter- est and ability are then scheduled for upcoming training sessions. This is our third year, and it's going well. We've trained and certified over a 120 individ- uals and of these graduates, roughly 80% have made it through the program at a class-three level. All of the technical curriculum is devel- oped at an IPC class-three level, the most strin- gent class, for mostly aerospace companies. The course curriculum is designed and devel- oped based upon industry standards and in- put from our partnering employers to ensure that the curriculum addresses all of their spe- cific and unique skill requirements. 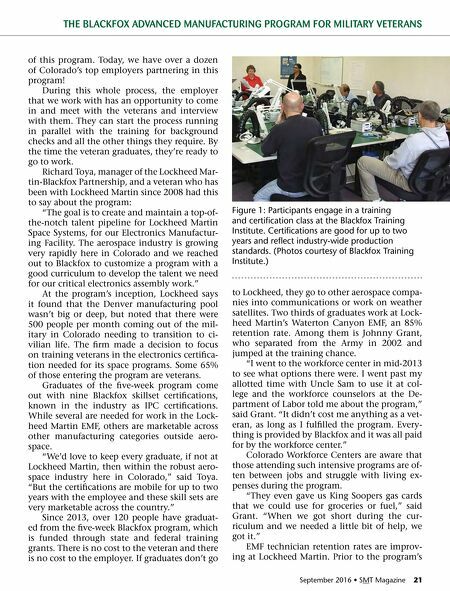 Lockheed Martin in Littleton, Colorado was our first em- ployer to step up and really want to be a part THE BLACKFOX ADVANCED MANUFACTURING PROGRAM FOR MILITARY VETERANS " Upon completion of the course, veterans can qualify for employment in aerospace, defense, medical, and all facets of electronic manufacturing. "